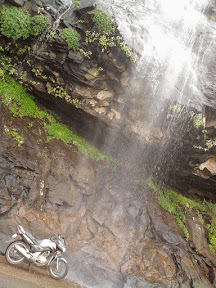 At the last trek event, Manas the ‘biker’ had put a request for a bike ride, then I’d said I’d probably be at Bangalore, but if I’m back we could plan one to Malshej Ghat, which would be a wonderful ride on the NH 222. So faithfully, Manas called at 9.30pm in the night, checking if I’m available, and I was, instantly – Next day @ 8.00am plan was fixed. Vj (moronzkreacionz) couldn’t make it. So with just 2 of us, it was on my bike, Honda Unicorn (150 cc, 13.3 bhp @ 8000 rpm) was to lead us to Malshej on 18 September 2010. Manas made it to my house on time, and we left instantly after a tea. I was the first to ride till Kalyan-phata, where we took a right for Murbad. We stopped at a local Udipi restaurant to have a tea break, it was 10.30am. There on we moved through the outskirts of Kalyan reaching Shahad where the NH 222, Kalyan, Maharashtra to Nirmal, Andhra Pradesh was waiting. I let Manas ride. Just after Murbad one of the lovely local town en-route to Malshej, there was a रास्ता बंद demonstration, by locals to criticize the inefficiency of the local govt, police to prevent thefts on the road. The whole road was barricaded with burning tires. Luckily being on a bike, we were able to circumvent after moving ahead of a kilometer long train of parked cars, buses and trucks. The road was a little bumpy, probably rains doing its damage near the earlier end of the ghats. But it smoothed out later. The sudden view of the big Malshej ghat region in front of us was captivating. As the ghat started, so did the streams, waterfalls around the road. As we moved ahead, one waterfall right on the top of the road cooled off the heat and the grime that we had collected. We moved ahead, both of us were hungry. It was almost 12 in the noon. We moved towards the tunnel, where we stopped and went towards the needle point. Enjoyed a few snaps and back on the bike. I chose to move right towards Khubi phata, where the nostalgia inducing roads of Harishchandragadh awaited. Still further we went right to the gorge that divided the view of PimpleJoga Dam and the Madh village on the other side. We returned back from that gorge and were lucky to find a shade of a tree well made to sit. And as if that luck wasn’t enough, there was a Hand pump as well. We cleansed ourselves and went back to the tree where we had the तिखट मिठाच्या पोळ्या and Orange juice. We decided to even clean our bike, so filled a plastic bag with the water at the hand pump and chilled the black seat of the bike and the engine. Yet again on the bike, we moved ahead checking which waterfall should we spend some time and have a clean shower! We went pass through 3 falls, until we spotted one just on the road, which had no one. And the fall came from atleast 30 feet above the road. We drenched ourselves in the cold water and mounted ourselves us again for the trip back to Mumbai. We left the ghat around 2 with Manas riding the bike and me as a pillion. On our route back, luckily the road block had cleared near Saralgaon (सरळगाव), and we moved ahead towards Kalyan. At Shahad, we exchanged our seats and zoomed till my place where we reached by 5pm.